the likes of which the world will again not see. In the mid 1950’s Norman Adams was studying art at more or less the only Art School in the US that was still teaching their students how to paint realistically. For this reason it was the only place in the country that agents of commercial art could go to to recruit artists for their commercial art agencies, Illustration Agencies. Norman Adams knew this so while studying Art in LA he spent his years there creating the best portfolio he could so it would impress the recruiting agents. His portfolio was so impressive that it convinced all three of the top Illustration Agencies in NY to hire him. So when he left LA in 1957 for NY he walked into the Charles E Cooper Studio and started to work and work. 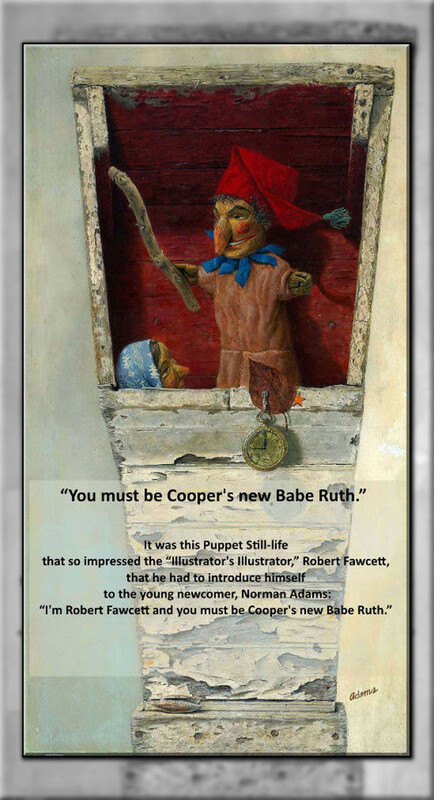 Indeed he was so busy working of Cooper that he had no spare time to make paintings for the NY gallery owners who were begging him to give them his originals paintings to sell. In the mid-1950's Charles E Cooper was the most renowned and successful Illustration Agency in NY which after WWII meant “world.” Cooper had over 60 of the best Illustrators in the country working for him. But when Norman Adams arrived he had no illustrator who could do the work on a large new contract he just got from “Ester Williams Swimming Pools.” So Adams got the job and then like a chain-reaction more and more jobs followed. Illlustrators Society Hall of Fame, Murray Tinkelman, gives us his story that reveals just how competitive commercial art had become when Norman Adams started his professional career in NY. And this was happening when the publishing industry was changing radically so there was less and less work for illustrators to do. long after all the big Illustration Agencies were gone. the way it has been documented.